Before you can use NetStores FrontPage E-Commerce Add-Ins, you must sign-up. When you sign-up, there is no obligation to pay any money yet; you can "check things out" first if you wish. If you do wish to setup a store, check out our products and prices and contact NetStores. 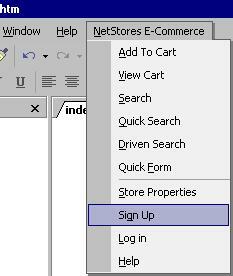 To sign-up with NetStores, from within FrontPage, select the Commands > NetStores E-Commerce > Sign Up menu entry.